Perhaps I'm wrong about the series. Perhaps I'm too fickle and transient in my affections, and can't stay loyal to something for all its flaws. Yet whilst initially I was truly bewitched by this BBC adaptation of the monolithically-long novel, and in admiration for how it was capturing a sprawling narrative concisely without losing complexity, I started to sense the, well, magic fading significantly in the hurried, frantic last two episodes of this splendid adaption, and here I think is the main reason why - the very complexity meant that despite seven hours of material, so much was left skin-deep. And I'm not pulling the usual act of the grumpy book-fan too-harshly judging the film version. Honestly, the book is too damn long and too big to lug my copy around so remains only partially read, and whilst I like what I read a great deal, I don't see it as perfection as many do, nor have the fervent love of someone who has more dedication and upper body strength to lift the damned thing. After my glowing review from watching the first two episodes, the narrative settled too quickly into an endgame. Strange and Norrell were apart and at odds just as we had got to know a little of them together, and Norrell was retired to a secondary position, stood back, often silent, often inactive, whilst Strange ran off with the passion and plot. This is a fundamental issue in terms of the drama for me. Two good characters portrayed by two excellent actors, yet the one so vividly drawn with compassion and humour early on is turned into a frustrating and one-note cypher that doesn't make sense. 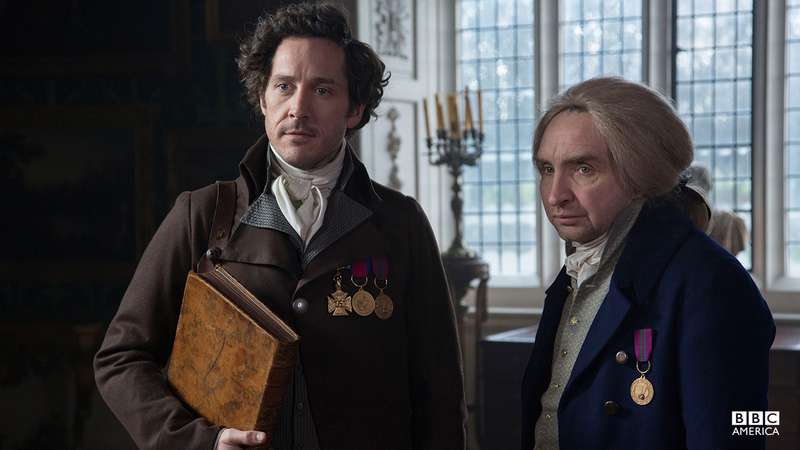 The nub of their relationship is that Norrell arrogantly wants magic back in England within formal constraints of his own choosing and against the wild will of the masses, whereas the more innocent yet more generous Strange wants to leap unchecked into the experience and not contain the wonder of practising magic. For a while, as the latter is swept away in popular use in the war against Napoleon and we are treated to battlefield spectacles and tensions in Portugal and Belgium, Norrell remains a comprehendible dove to the hawk of Strange, yet we begin to lose sight of him emotionally and are asked to side heavily with both his rival and with Childermass, the character I perhaps like the most here, played superbly throughout by Enzo Cilenti. 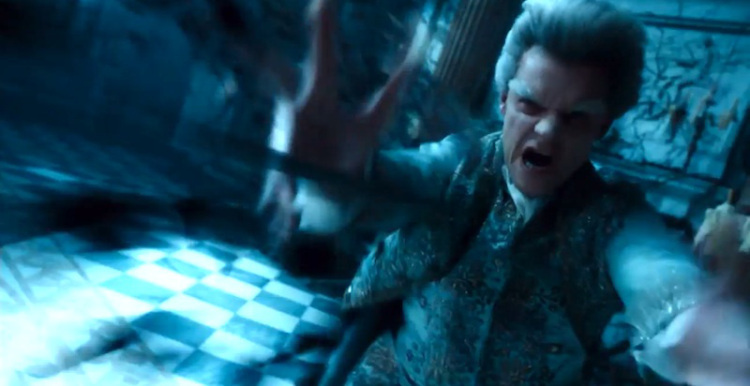 Maybe my biggest problem is a failure to understand the motivation behind Childermass's loyalty to his master, and to clarify why Norrell seems to know so much about how magic went wrong in the past and so why he fears its misuse so much today, and yet reneges on that fear in his conjuring of a fairy himself. This early action, to get the fairy (portrayed with constant simmering glee and mannered menace by Marc Warren) to bring back Lady Pole, results in the entire arc of the plot, and ultimately (seriously guys - spoilers !) dooms him and Strange and brings pain and misery and death to others. But neither Norrell's surely-present guilt nor his inability or disinterest to manage the situation were satisfactorily explained to me at least, and in this absence my frustrations grew, out of seeing the very characters I loved act in unconvincing and veiled ways. Why can't he aid Strange and why is he so fearful? It's something vital to the whole structure and is left sorely invisible. So the complexity of that motivation, impossible to display in a few minutes of film, is perhaps a consequence of the original tale, and not of the telling by screenwriter Peter Harness and director Toby Haynes, but the emphasis they place on some moments and dismissal of others (due in large part I'm sure to a lack of time) exacerbates the problem. Strange is shown with detail and lingering shots of his emotional world, and Norrell is kept an enigma without and Norrell is kept an enigma without enough attention to his plight. As they finally come back into conflict, the younger man remains who we are asked to see things with, and the man we were originally siding with back in episode one is shown largely only refusing to answer questions, staring coldly and silently, or dismissing away Childermass's appeals for common sense action in favour of the unconvincing schemer Lascelles (in Norrell's trust of this clearly untrustworthy chancer, we lose our respect for Norrell's intelligence and experience, which is fine, but we don't see why he is so keen to side with Lascelles throughout). I was delighted by the early scenes with Norrell, but saw his arc a failure of the narrative - you can't have an unexplained mystery around a character's action left unexplained when that is the cause of the whole storyline onwards. All these moans and many more besides wouldn't matter too much if the emotional pay-off in the finale worked, but it doesn't, not entirely. As Strange cheesily appears in a fountain to say farewell, I wanted his wife to say, "Okay, what the hell is going on and what happened? No, really, stop going on about not having much time to chat like you're in a phone booth with only one coin and explain yourself", as instead I saw them all politely accept their unexplained fate. And while it was gratifying to see Childermass in control and get the last word, along with my other favourite character Segundus, that final scene felt rushed and too much was left unsaid. Now, in both cases, I'm not asking for some Murder She Wrote summing-up with everyone gathered in the drawing room, but some more exchanges of people demanding explanations and answers would have rung truer to reality and allowed some closure on events. While it's true that the novelist Clarke intends a sequel, it took her a decade over a decade ago to produce the first, so we aren't talking Potter or Thrones levels of production and therefore leaving an unsatisfying tangle of loose ends is in my mind no way to send punters home happy. Still, that there internet seems to tell me most people (well, TV critics) are happy. I arrogantly think a part of that is the blind eagerness to enjoy something and find triumph in partial success as it makes better copy that the tangental whining of, say, oh, me. However, while ratings here in Britain have slumped it does seem to be hailed as a triumph. I must emphasise how my views on the awesome performances (too many to mention, but both actors for Lady Pole and Vinculus deserve a special nod), the wonderful cinematography and effects, and the editing are still very positive, and the plot with its urgent promise of a resolution pulled my interest forward eagerly to each new instalment. But the three areas above hung over like an ever-more-weighty cloak and stopped me from feeling the true exhilaration of fantasy drama done well. However, the mere fact that I'm revisiting it here, and watched it all, and have so many feelings, proves the success of it in large part. I would love to know what you all thought.